Fryslan (Friesland) is the maritime province which includes land reclaimed from the former Zuider Zee area. The capital is Leeuwarden. (which is in the map above the “4” in 1498). Ruled as a county of the Holy Roman Empire during the Middle Ages, Friesland passed to Saxony in 1498 and, after a revolt, to Charles V of Spain. In 1579 it subscribed to the Treaty of Utrecht, opposing Spanish rule. 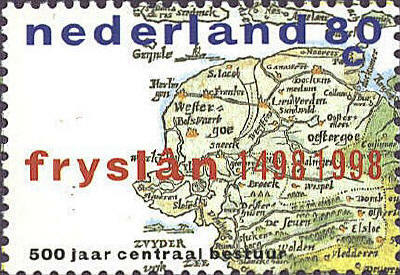 The stamp is part of a set issued in 1998 to commemorate the half-millennium of Fryslan as a part of the Netherlands. 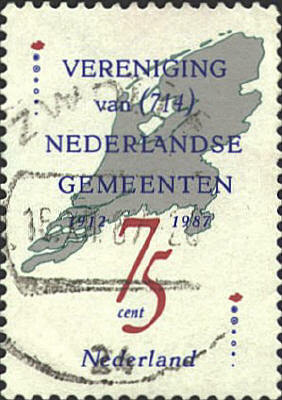 The stamp was issued in 1987 to recognize the seventy-fifth anniversary of the Union of the Netherlands Municipalities.